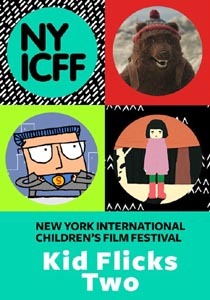 With a compelling range of styles and themes, Kid Flicks Two offers clever, thought-provoking films sure to inspire audiences ages 8+ to expand their horizons. In the Grand Prize award-winner ​Game​ (USA), AJ has the drive to excel but must push through obstacles to get there. Meanwhile, teamwork takes on different stripes when an odd couple of bears are forced to work together in the hilarious stop-motion short ​Poles Apart ​(UK). Plus, the CG-animated wonder ​Gokurōsama ​(France) bridges cultures and generations by showing us that even in an automated age, a little human touch can still work wonders. Jiro feels sick. When his father takes him to the doctor, tests confirm it’s nothing serious… and yet reveal surprising news about Jiro. But who says you can’t challenge the results? Deep at night, a dedicated cyclist traverses the wintry forest. The challenge: make sure this new day gets off to a fresh and timely start. Nanuk, a tough-talking polar bear, meets Aklak, an enthusiastic grizzly, when he encroaches on her own dwindling turf. She’s understandably a little less than patient with his clueless cheer. Sasquatch. Bigfoot. Call him what you will, if you can catch him on camera, that is, in this surprising look behind his elusive nature. A.J. Green, a new kid in town, shows up at boys’ basketball tryouts and instantly makes an impression. Can it be sustained? Mexican country craft meets-cute with NYC urban grit in this tale of a near-perfect mâche.